Ever tried an infrared sauna before? There’s no better time than now to experience the benefits for yourself when you try the infrared sauna at Melbourne Natural Medicine Clinic. 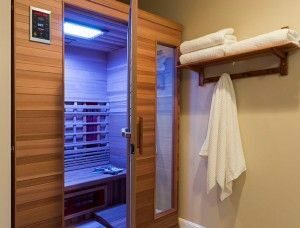 An infrared sauna uses light from infrared heaters to create heat, which Infiltrates your body directly without heating the room to the extent of a conventional steam-based sauna. Also known as a far-infrared sauna, they offer a more appealing alternative to traditional saunas that can prove to be uncomfortable for users who might struggle with the higher levels of heat. How Does an Infrared Sauna Differ from a Traditional Sauna? While a traditional sauna uses heat energy created by electricity, gas or wood to heat up the room – which then heats up the body – the infrared sauna uses light to produce radiant heat which is directly absorbed into the body. For people who struggle with the extreme heat of a traditional sauna, the infusion of heat from the infrared sauna directly into the body rather than the room means that temperatures are significantly lower and therefore more tolerable. For people in good general health, infrared saunas are safe to use on a daily basis and in fact can help to enhance health benefits. For people with a heart condition or low blood pressure, we suggest seeking your doctor’s approval first before using an infrared sauna, as sitting in them for extended periods of time can elevate the heart rate significantly. For men looking to have children in the short term or long term future, it’s important to be aware that heat from a sauna (any type of sauna) can have a negative impact on the motility of sperm. Can Infrared Saunas Give You Cancer? You will not develop cancer from using an infrared sauna. Infrared light does not contain the ultraviolet rays (i.e. the rays that do have a link to various cancers) found in solariums or tanning beds, and is already frequently used to heat incubators for premature babies. Detoxification – Regular infrared sauna sessions can help eliminate toxic heavy metals from your body that can have negative effects on your health. Improved heart health – Some studies have shown that regular sauna use can help to reduce high blood pressure. Pain relief – Sufferers of joint rain and other types of chronic pain may benefit from regular sauna sessions. Relaxation – You can enjoy enhanced stress relief, with infrared sauna therapy aiding in balancing the body’s level of cortisol – the key stress hormone. The sauna’s heat will also help alleviate tension in the body and relax the muscles, enabling you to de-stress easier and quicker. Weight loss – Your body’s core temperature will increase as the heat created by the sauna penetrates your body and increases your heart rate. The body will generally burn more calories as it attempts to bring the body back to resting core temperature. Anti-aging – 20 to 30 minutes per day in an infrared sauna can help to unblock pores, allowing skin to purify and look fresh. How Frequently Can You Use an Infrared Sauna? While it’s perfectly safe to use an infrared sauna on a daily basis, most regular users will go three or four times a week, with sessions typically lasting between 30 and 45 minutes for optimal effect. Should You Shower After an Infrared Sauna Session? It’s generally wise to shower after enjoying an infrared sauna session. As you sit in the sauna, you sweat out toxins and can continue to sweat for another 10 to 15 minutes after your session. Hopping under a lukewarm shower not only speeds up the cool down process, but also washes away the toxins that have been sweated out. What Other Services Are Offered at Melbourne Natural Medicine Clinic? In addition to offering an infrared sauna in Melbourne, clients also come to Melbourne Natural Medicine Clinic when they’re looking for a naturopath in Victoria, cupping treatment, acupuncture for tinnitus or just general acupuncture in Melbourne. To learn more about these services, or for information on anything else we provide, give us a call on (03) 9686 2566.